PA accuses Israel of using "poisonous gas"
Yesterday, Israel carried out a controlled explosion to destroy an attack tunnel dug by the Palestinian Islamic Jihad (PIJ) terror group that started in the Gazan city of Khan Younis and crossed into Israeli territory. A member of Islamic Jihad, Khaled Al-Batsh, explained [in Al-Dustour (Jordanian newspaper), Oct. 31, 2017] that the tunnel that Israel attacked "was intended for freeing prisoners from the Israeli occupation prisons." Al-Batsh was implying that the purpose of the tunnel was to facilitate the entry of Islamic Jihad terrorists into Israel, to kidnap Israelis who would then be used as hostages to force Israel to release prisoners. At least seven members of the Islamic Jihad and Hamas terror organizations, including senior terrorist commanders, were killed in the explosion of the tunnel. Instead of condemning the digging of the terror tunnel, Mahmoud Abbas's PA and Fatah chose to accuse Israel of using "poisonous gas" in breach of International law. 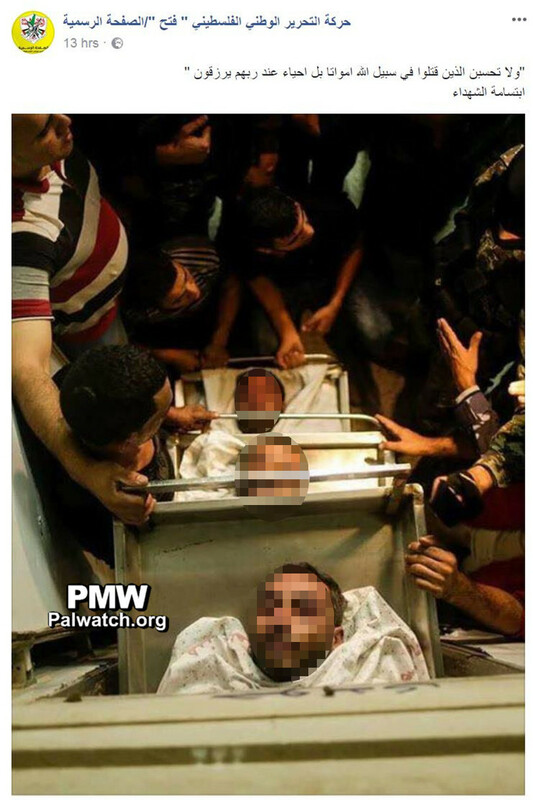 "Most of the injuries among the Martyrs (Shahids) and wounded occurred during the inhalation of gas (there is no evidence Israel used gas in destroying the attack tunnel -Ed.)... There is speculation that Israel used an internationally forbidden weapon during this incident. Therefore, we call on all of the international organizations to stop these materials that the Israeli occupation is using against our unarmed people." The Fatah Movement condemned the Israeli crime and emphasized in a statement yesterday that this pure blood was not spilled in vain, and that those who committed the crime will not escape justice." The official Facebook page of Mahmoud Abbas' Fatah party posted pictures of three of the dead terrorists. "The smile of the Martyrs (Shahids)"
The image shows 3 terrorists who were killed as a result of the explosion. PMW has blurred their faces.